So, needless to say I never got around to photographing my birthday cake which is a real pity because it was rather epic. On the plus side, it does mean I need to make it again some time in the future. Assuming I can afford all the ingredients; half a kilo of good chocolate, twelve eggs, and four cups of cream are not the core ingredients for a cheap cake. Nor are they the ingredients for a cake that you should consume on a regular basis, through part of me would like to try. This cake of mine left me with a fair few egg whites to use up - so what better way than meringue? 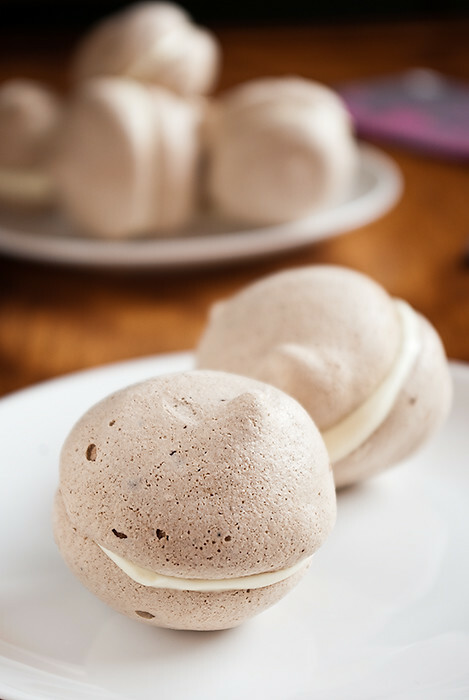 Especially considering prior to making these I had never made meringue before. Sure, I've made meringue based icings and what not but never meringue that is nothing more than meringue. That said, I'd like to think that these are more than meringue because they are! They're meringue filled with cream. Admittedly that's really not a huge step up from plain old meringue but it's a step nonetheless. A small step for a small person, I guess. Speaking of small steps - in about two-and-a-half weeks I have finished my degree. That's four years of degree over in a matter of weeks. Can anyone recommend any good celebration desserts? If they're somehow related to the number four, even better. Maybe your favourite four ingredient dessert, or maybe a cake that somehow uses four cups of cream? Help is appreciated! Preheat oven to 120°C (250°F), grease oven trays and line with baking paper. Beat the egg whites in the bowl of an electric mixer until soft peaks form. Gradually add the sugar, beating until dissolved between each addition. Fold the cocoa powder, orange rind, and liqueur through the egg whites. Transfer the mixture to a piping bag, then pipe equal sized rounds onto the lined trays. Bake for 1 hour, then cool on trays. Combine the milk, orange juice, Grand Marnier, and orange rind in a small saucepan and bring to just below the boil. Remove from the heat and set aside for 15 minutes to infuse. Combine the egg yolks and sugar in a bowl and whisk for 1-2 minutes, add the cornflour and whisk to combine. Reheat the milk to just below the boil, then strain over the egg mixture, whisk to combine then return to the pan and whisk over medium heat for 3-4 minutes, or until thick and smooth. Transfer to a bowl, cover with plastic wrap and cool. When completely cold, whisk in the cream. Continue whisking until thick and smooth. Refrigerate until required. Using a teaspoon, scoop out the centre of the meringues and set aside. Fill a piping bag with orange cream, and pipe enough cream to fill the hole in the meringue. 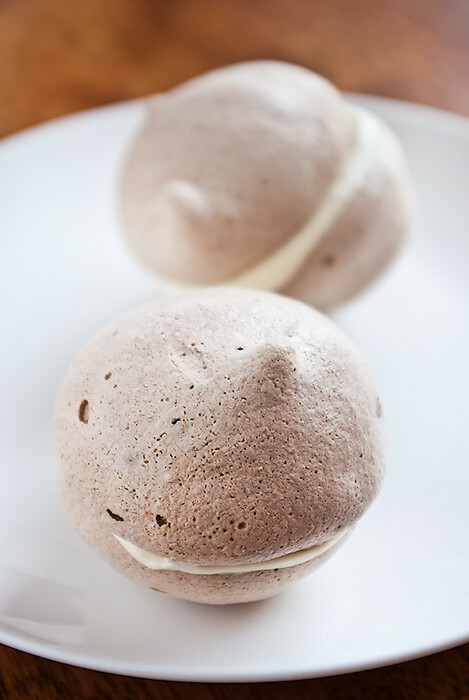 Sandwich two filled sides of meringue together and refrigerate until required. These meringues look fantastic. I love chocolate orange. Wow, 12 eggs and half a kilo of chocolate - your birthday cake does sound rather epic. yum - a fantabulous looking (and gluten free!) dessert! Happy belated birthday! I would have loved to see you cake, it must have been delicious. Congratulations on your degree, I remember the feelings, both disbelief and exhilaration. A chocolate flourless cake would have 4 ingredients, butter, sugar, chocolate and eggs. Jennifer: Thanks, it was pretty epic! Dustin: Thanks, I might. Who knows! Jas: Thanks, I'm definitely going to be jumping on the meringue bandwagon. Laura: Thanks, it's a pretty great feeling. Mostly of relief at the moment. I may have to make flourless chocolate cake but I'm trying to find something I've never made before!